As summer approaches we start digging in our closet for the swimsuits to flaunt the perfect body. But if we have stomach hairs then we start thinking twice about wearing our swimsuits. This is because even after shaving off those irritating stomach hairs they keep growing back, and worse, they are often darker and thicker. But don’t worry ladies and gentlemen, as in this oneHOWTO articlewill show you how to remove stomach hair without shaving. Pull the strip in the opposite direction of hair growth while holding your skin tightly with the other hand to tense it, and voila! Out come the hairs. Just be careful not to do it too aggressively to prevent wax burn marks. Apply a moisturizer after you have waxed the area, and make sure you get rid of the sticky remnants of wax. Once you remove the stomach hair through waxing you can be hair–free for at least three weeks. Also, with repeated waxing over time, the stomach hairs that will grow back will be less coarse and much thinner than earlier ones. Pros of waxing stomach hair: It will last longer than any other temporary method of hair removal and will leave your skin smooth if done properly. Cons of waxing stomach hair: If you have very light colored stomach hair, we advise against waxing, as it will initially re-grow thicker and will take a while until hair follicles grow weaker. If you've never bleached any part of your skin before, do a small allergy test on a small patch of skin and wait 24 hours to see if your skin reacts to it. Mix the ingredients as indicated on the bleaching product's package and apply a homogeneous layer on your stomach hair. Leave on for the time indicated in the instructions and make sure you do not leave for a longer period of time, as it may harm your skin and even burn it. Scrape the paste and wash with water and mild soap. Make sure you exfoliate the area once a week to prevent ingrown hairs and follicle inflammation. For more information about lightening the stomach hair using bleach, and some other natural options, you may want to take a look at our other article on lightening stomach hair. Pros of bleaching: It's ideal for women who have short stomach hair that is only concentrated in a small area. It is also ideal if you don't want hair to grow back thicker or darker. The hairs will be practically invisible for as long as waxing lasts. Cons of bleaching: Bleaching stomach hair is not recommended if you have a darker skin tone, as it will leave the hairs looking blonde and will look highly unnatural. For women who have little hair but the hairs are quite long and visible, bleaching is not a good option either. Again, before using a hair removal cream do a patch test. Then, decide on the one that suits you the best and use it on your stomach hair. Apply the cream on the stomach area and leave on according to the product's instructions. After this time has passed, scrape the cream off and you'll notice how the hairs will have come loose and will also be scraped off. This process is fast and easy, though you'll notice how your hairs will reappear shortly and may cause irritation while they are growing. 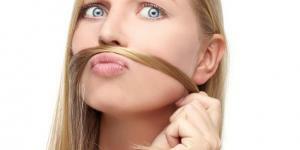 Pros of hair removal creams: Hair removal creams are easy to use as they can remove the unwanted hairs within minutes. Cons of hair removal creams: This process is quite similar to shaving your stomach hair, which is not a very good idea if you don't want your hairs to grow back within a couple of days in a darker shade and thicker, which is why it's only recommended for men who only want to get rid of their stomach hair for counted occasions. Sterilize your tweezers to make sure you don't infect the follicles. Pluck in the hair in the direction of hair growth. Apply ice cubes directly after to reduce inflammation or an anti-inflammatory solution. This is a good way of getting rid of any stray and difficult hairs that may appear in the area. Pros of tweezers: The results will last as long as waxing and is a good choice for those who have just a few unsightly hairs. Cons of tweezers: It's a pretty slow solution and may cause irritation of the skin, especially if you are highly sensitive. Laser hair removal is a permanent but expensive solution to get rid of the unwanted stomach hair. If you have excess body hair then laser hair removal is a good solution for you. Laser removal works best for those people who have dark hair and lighter skin tone. But before going through the laser hair removal process its best to consult a trusted doctor as this technique involves some risks like blisters, burns, scarring, pigmentation and pain. If you have been waxing your stomach area for a long time, then this technique will require more sessions, but it will be a much quicker process if you have been shaving or using creams to get rid of the hairs. If you want to read similar articles to The 5 Most Effective Ways to Remove Stomach Hair, we recommend you visit our Beauty & Personal Care category. Though using a razon may seem a good idea as it's the fast solution, we don't recommend using it on this area, especially for women. I tried shaving my hair off as it grew back after my first session of laser hair removal. I was quite desperate as it was my second session and the hair was growing back, it is the middle of the summer. Is this fine or will it affect the IPL treatment for my stomach hair? It is not advisable, as mentioned in the article, to use a razor to remove stomach hair. However, when getting laser treatment, using the razor is the only safe way to get rid of hair growth after sessions, as any of the other methods are inadvisable for your situation. It is an ok solution for an emergency, but you should try to be patient and wait until the next session, it will eventually stop appearing. My understanding is shaving, doesn't actually make it thicker, if not temporarily and to a very limited extent, because of the blunt cut, which gives this illusion. So I think you can shave, you are going to laser it anyway.